Stitched Together: A Very big FO! This has to be one of my biggest finished objects for a very long time. This project was started in July 2011 and is now finally ready to be revealed. May I introduce, Lily's Slice of Pi Shawl Pattern. The shawl comes in two versions, the first, shown above has a ruffled border. The second option has a straight border, as shown below. There is very little difference in the pattern for the two version, but the ruffled version does require a greater quantity of knitting (and yarn)! The navy shawl is knit in Fyberspates Scrumptious Lace, which is 55% Merino and 45% Silk and is a 2 ply laceweight yarn. I used 760m of this yarn for the unruffled shawl. 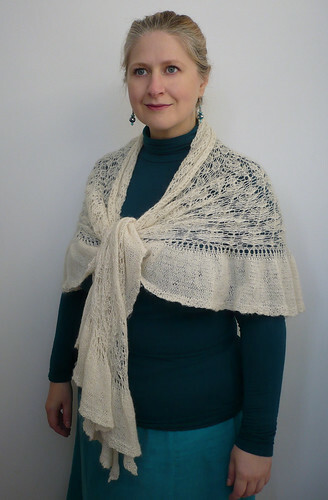 The cream shawl was knit in Rowan Fine Lace, which is made of 80% Alpaca and 20% Merino, which is also a 2 ply laceweight yarn. I used 1007m of this yarn for the ruffled shawl. This design works as a light weight shawl in either warm or cold weather. The navy version is very comfortable in warm weather and is perfect to take on holiday for evening meals outside. The cream shawl is much warmer due to it's alpaca content. I often wear it as an additional layer when I go out, even in Winter, as it easily fits in my (admittedly large) handbag. 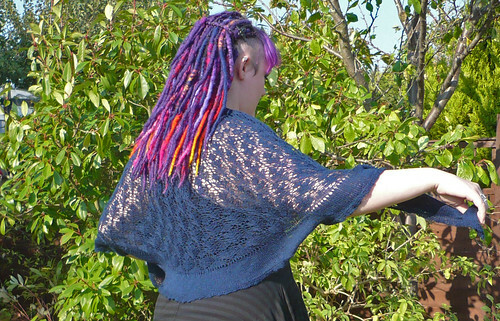 The shawl is constructed using Elizabeth Zimmermann's Pi Shawl construction, halved. The result is a semi-circular shawl that only has 7 or 8 increase rows (depending on whether you chose to do a ruffled edge or not). 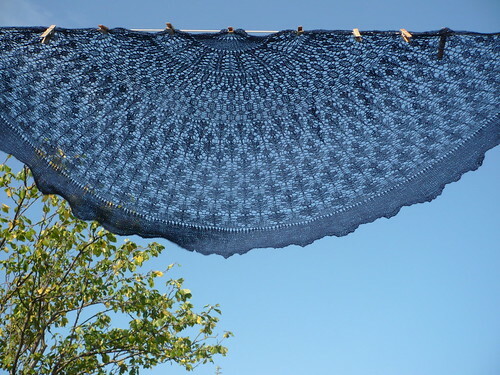 The increase rows are not within the lace charts, so whilst the shawl looks complicated, in reality it is not that complex as you do not have to try and fit in a variable number of repeats in the charts. The pattern is written out in full, but also provides large clear charts so you can chose whichever option you prefer to follow during your knit. The pattern is written in large clear font, as are all Stitched Together Designs, and stitch counts are provided on each increase row so you can check that you have the right number of stitches before you start the next lace section. 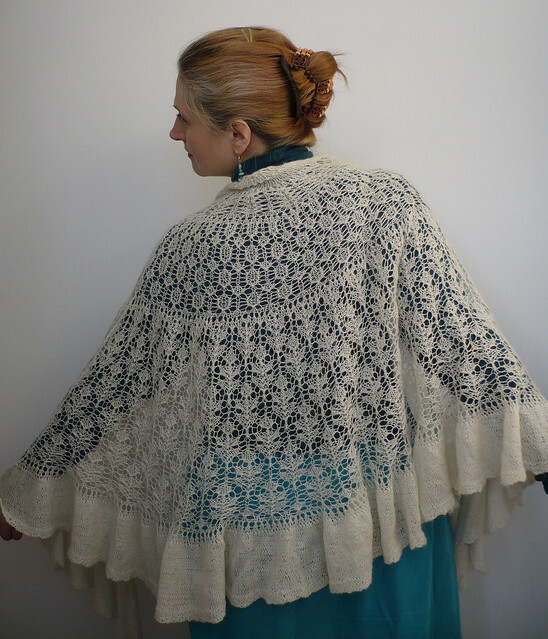 As you can see from all the photos, the shawl can be worn in many different ways and it's style is altered as easily as the yarn it is knit with. My test knitters used a wide variety of yarn which can be seen by clicking on the testers name on this project page. 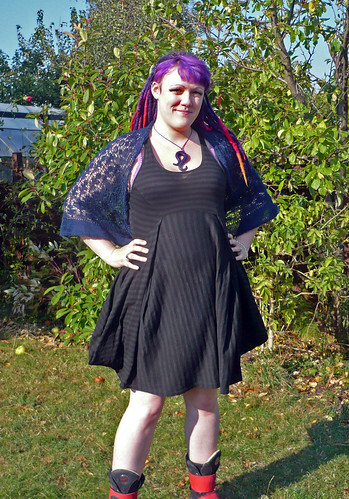 By the way, my gorgeous friend Jo is the model for the navy shawl photos (which she now owns). Oh and it you are wondering about the name, Lily was my Scottish Grandmother and the largest lace section on the shawl is the Thistle Leaf Pattern. Of course anyone with Scottish blood knows that the thistle is the national flower of Scotland, so the name seemed obvious (to me!). The pattern is now available to download either directly from Ravelry or from my downloads page. 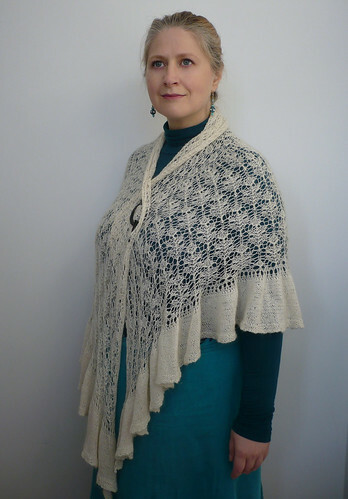 This 13 page pattern also gives tips on how to block this shawl to best affect, so this could be a good first lace pattern for someone who wants to move up from 4 ply shawlettes to a larger shawl in laceweight. The price of the pattern is £3.75, which is roughly US$5.95/€4.48/AUS$5.51, at the date of publishing this post. 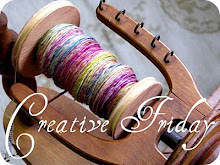 I hope you believe that this FO is worth the wait! If you have any questions about the pattern, please let me know and I'll try and answer them as best I can. 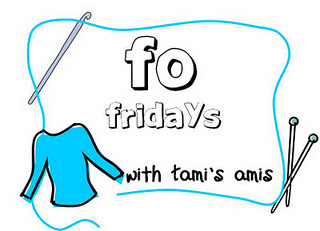 I am hooking up to my usual Friday Links. To have a look at other people's finished objects, have a click of a button!